Italy's northern border follows the watershed that separates the drainage basins of Northern and Southern Europe. Running mostly at high altitudes, it crosses snowfields and perennial glaciers--all of which are now melting as a result of anthropogenic climate change. As the watershed shifts so does the border, contradicting its representations on official maps. Italy, Austria, and Switzerland have consequently introduced the novel legal concept of a "moving border," one that acknowledges the volatility of geographical features once thought to be stable. A Moving Border: Alpine Cartographies of Climate Change builds upon the Italian Limes project by Studio Folder, which was devised in 2014 to survey the fluctuations of the boundary line across the Alps in real time. 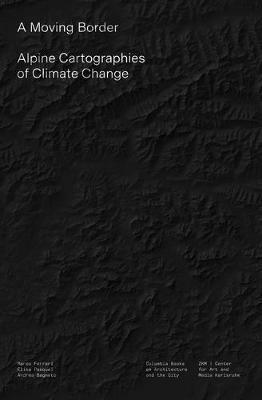 The book charts the effects of climate change on geopolitical understandings of border and the cartographic methods used to represent them. Locating the Italian condition alongside a longer political history of boundary making, the book brings together critical essays, visualizations, and unpublished documents from state archives. By examining the nexus of nationalism and cartography, A Moving Border details how borders are both material and imagined, and the ways global warming challenges Western conceptions of territory. Even more, it provides a blueprint for spatial intervention in a world where ecological processes are bound to dominate geopolitical affairs. A Moving Border features a foreword by Bruno Latour and texts by Stuart Elden, Mia Fuller, Francesca Hughes, and Wu Ming 1, and is co-published with ZKM - Center for Art and Media, Karlsruhe.